Into every life, a little rain must fall. That aphorism also applies to blocks, and as Ngmoco’s Topple proves, it makes for a great game for the iPhone and iPod touch. 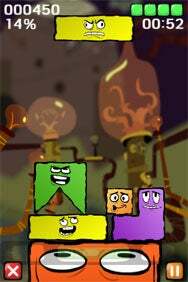 Block Party: Faces tell the story in Topple, which blends elements of Tetris and Jenga. The facial expressions of the blocks reflect the stability of the tower you’re building. The puzzle game from Ngmoco combines elements of Tetris and Jenga, challenging the player to stack the highest tower possible via a collection of random shapes. As with Tetris, you rotate the shapes provided, dropping them into place. As for the similarities to the wood block game Jenga, Topple makes you work to keep your shapes from losing balance and collapsing the tower—the game ends if four pieces fall off the board. Topple picks up where those classic games leave off, adding its own spin on things. For instance, Topple’s blocks are alive, with facial expressions that react to their position on the board. Place a block in a stable position and it’ll smile contentedly. Stack a block in a precarious position and a look of caution or outright panic will emerge, warning you that the block is in a shaky situation. As the game continues, the odds become stacked against you. While the lower levels begin with flat surfaces and easily stacked pieces, later levels begin with curved surfaces to build upon and more random shapes to stack such as triangles and eggs, making it harder to maintain a stable tower. There’s a definite polish to Topple. Clever details and snarky graphics combined with imaginative, detailed backgrounds round out the visual elements. Though not extensive, Topple’s sound is second to none and changes in tone to indicate if your tower is stable or about to collapse. It’s these sorts of little things that make Topple stand out, as a quick run through the game’s training sequence proves. Here, players learn to use the built-in accelerometer of the iPhone or iPod touch to tilt the handset to control which direction the tower sways. Place a second finger on the screen and the shape can be rotated as needed before dropping it. A frighteningly realistic physics engine recognizes the center of gravity for the overall stack and players accurately feel the moment they’ve lost control of their tower. There are a few things Ngmoco could improve on, but honestly not many. The game ran well on my iPhone with the 2.2 software update, though occasional flickering and delays made me wonder if the program was about to crash. In these cases, the application seemed to right itself without incident. Topple is fun, imaginative, and appealing, especially for casual gamers looking to pass 10 or 15 minutes of time. Topple is compatible with any iPhone or iPod touch running the iPhone 2.1 software update.